Nowadays, there are a variety of scales available and each one tracks a type (or several types) of weight. From weighing animals to shipping boxes, Arlyn Scales has specialized scales made for practically any application. Items of larger weights require scales that can be placed on the floor, whereas some other scales are placed on flat table surfaces. Alternatively, some scales can weigh items that hang from a hook, offering maneuverability. So, the majority of scales are designed to weigh items of all sorts of sizes and volumes for the most accurate results possible. Veterinary scales are designed for animals of lighter weights, such as cats, dogs and birds. In order to withstand nail scratches from animals over a long period of time, these scales are made up of a metal surface. Livestock and veterinary scales both have a low height to make it easier for animals to step onto the platform. These scales are practical for weighing heavy items most often found in industrial settings, as ramps are available for them, too. They are characterized of a raised stage surface that weighs boxes as well as other large items. Floor scales come with a large platform and an extra high capacity. Industrial drums can be weighed on drum scales since these mediums come with a larger weighing area, making it unnecessary for the drum to be perfectly placed onto the center. Even if a part of the drum hangs out from the surface, the scale will still display an accurate weight measurement. These scales are usually placed on tables to weigh certain items. Although bench scales can weigh items like shipping boxes, they may not always be accurate enough to record the weight of smaller objects. High precision scales for industrial and scientific uses can be found at Arlyn Scales. They are used to measure lightweight items down to a 0.005% accuracy rate, and they also feature a more sensitive weighing mechanism for optimal accuracy. Bench scales are generally suited for portion control as well as parcel weighing and counting quantities. They’re available in several different models. Their weight capacity usually ranges between 150g and 300kg, with custom options generally available. Ranging from a 3Ó diameter for the gram units up to 24Ó x 24Ó, the high capacity version of these scales can go even larger. Instead of using a platform to weigh items, these scales utilize a hook to do so. The majority of supermarkets usually use these scales in the produce area where you can weigh fruits and vegetables. Many businesses even use these scales to hang larger items from a hook. A common standing scale cannot work alone to weigh wheelchair bound people. Arlyn Scales’ wheelchair scales can distinguish between the weight of the person being weighed and their chair. Using a simple, integrated computer program, the scale asks the user to input the chair’s model. Then, it’ll subtract the chair’s weight from the total weight to calculate that of the person. Arlyn Scales also provides these specialty scales. Using a circular platform, these scales weigh rainfall for a precise measure of weather conditions. They come with protected power supplies to avert accidental power surges or electrical shortages. These handheld scales offer the best portability. Pocket scales weigh smaller items and can usually weigh items of up to 500 grams. These scales can weigh food components along with chemical components and materials used in jewelry making. These are designed for jewelers to specifically weigh their items in grams, ounces and even troy ounces. Two common types of jewelry scales include bench scales and analytical scales. Due to the high demand for portability, these scales can often be found in pocket versions. Industrial environments are generally home to these scales that range from different shapes and sizes. Industrial companies that generally find these scales useful include, but are not limited to, agricultural businesses, trucking and automotive industries, and retail businesses. Even semi trucks and aircrafts can be weighed on industrial scales, as these scales have the capability of precisely weighing hundreds of tons. Some, on the other hand, are made to measure exact quantities of extra small chemicals and additives, generally displaying the weight options in fractions of a gram. Industrial scales are the head of a wide category of scales, inclusive of a platform, floor, or tank scales. These types of scales fall under the category of industrial scales. Lab scales are used by the medical and pharmaceutical industries, along with the scientific community. They can also weigh in small fractions of a gram. One type of laboratory scale—the analytical scale—can often record even a fraction of a milligram. The price of a lab scale is generally dependent on its precision and resolution, meaning the higher the precision, the higher the cost. 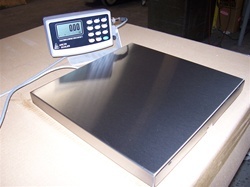 Several types of scales are available for measuring weight and meeting the preferences of several industries. Each model’s unique size, style and capacity make it capable of handling different levels of accuracy and precision, as well as varying applications. Although there are so many types of scales available in the market nowadays, Arlyn Scales is still the go-to location for all weighing needs. For more information on Arlyn Scales’ products, contact us at www.arlynscales.com.